Winchester chess club is a fabulous place to play. It's extremely user-friendly and allows players of all chess abilities to enjoy the great game of chess! 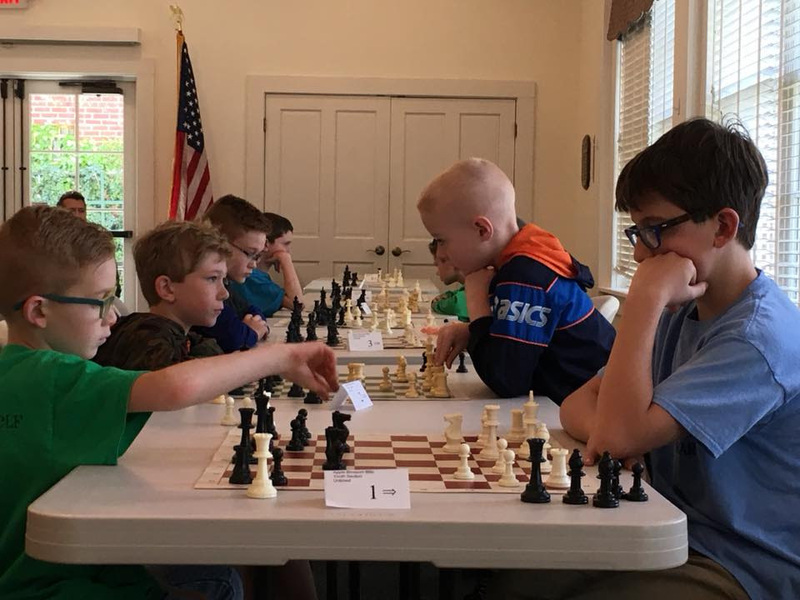 Whether you're a youngster just starting out or a seasoned Grandmaster, the Winchester Chess Club is a warm place to learn more about chess, to watch others play, and of course to come play yourself. Please feel free to contact us or to drop by. We look forward to welcoming you! Please click on our Events tab for chess meeting locations and times. For more info, please email David Hubbard at winchesterchess@gmail.com. SVCC is a warm place to learn and explore "The Royal Game of Chess". This is an open group for age groups and skill levels. We play chess in a friendly environment that champions learning, sportsmanship, and growth. 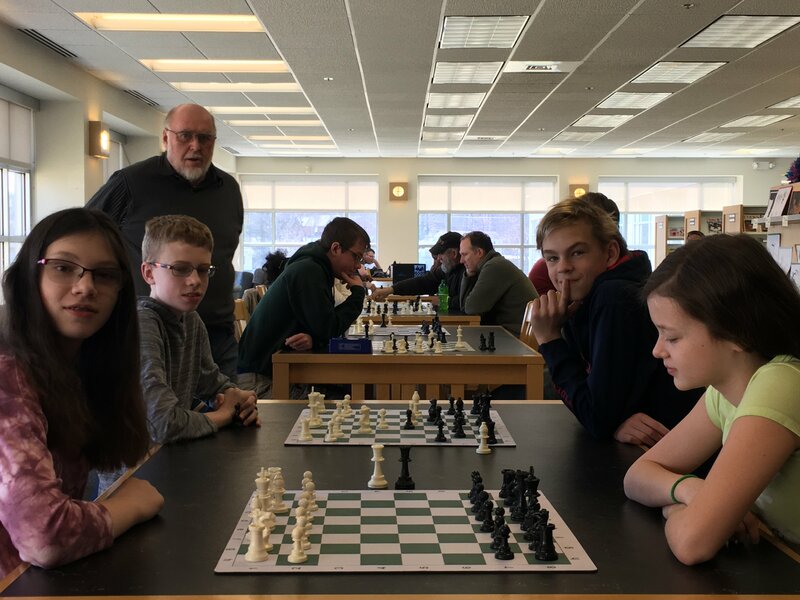 The Shenandoah Valley Chess Club is an affiliate of the United States Chess Federation and partnered with the Handley Regional Library of Winchester, Virginia. 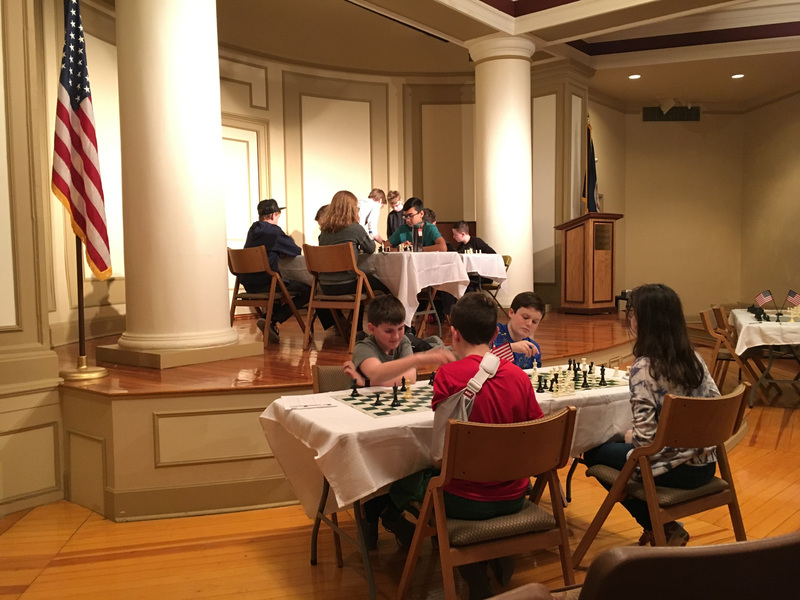 Events and classes are organized by Winchester resident and Chess Expert David Hubbard. Please contact David at winchesterchess@gmail.com for more info. We look forward to welcoming you!" “You work for a long period of time and the results don't show, but at some point everything just comes together..."
We hope your summer has been great! We missed meeting and playing chess these past weeks. The pieces are set for a fun fall season. 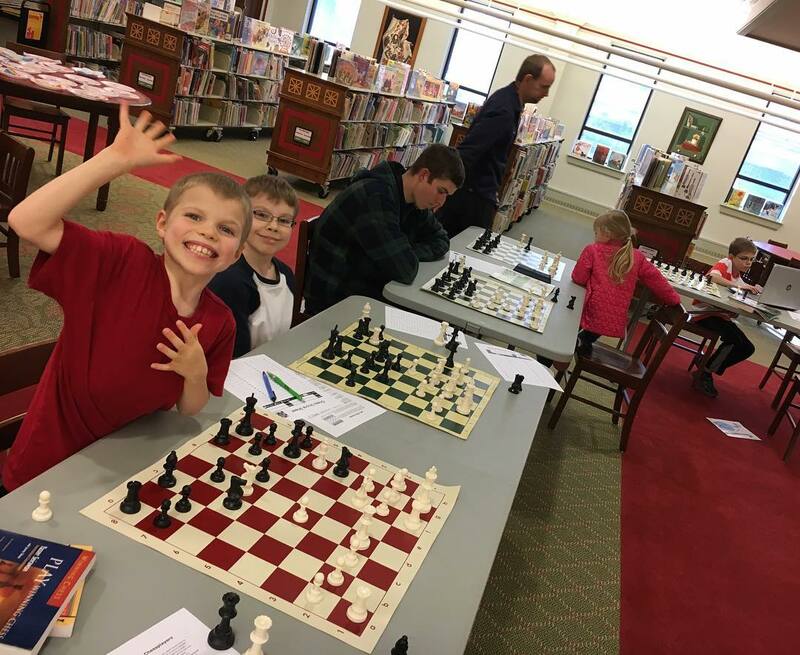 Shenandoah Valley Chess Club returns to Handley Library with an Open House Kickoff on Wednesday, August 22 at 5:30 pm. We will regroup, play chess, and brief the community on our plans for September to November 2018. Also, Wednesday, September 5 at 5:30 pm, we are throwing a party at Handley Library as Shenandoah Valley Chess Club celebrates its 5 year anniversary! We have done incredible work to reach this milestone. Thank you all for playing a part! We would love to see you there. Registration is open for the Fall Scholastic tournament. Full details can be found on the registration link. Sections: This unrated tournament is organized into multiple sections per grade and skill level (K-2 / 3-5 / 6-8 / 9-12 ). Medals and trophies for winners and special categories. Award ceremony for ChessKids players. Registration: Online Pre-Registration is open until 9/13. Onsite registration at 9:30 am. Round 1 - 10:00 am. General Information: The Fall Scholastic tournament is unrated and sponsored by Bowman Library. Chess sets, boards, and scoresheets are provided. Chess coaches will be onsite to guide first timers through tournament process and provide analysis in-between rounds. We will have trophies and medals for participants. Hats off to the Chess Kids who remained active over the summer. We will have special recognition for your hard work at the Fall Scholastic Tournament. For more information, contact Tournament Director, David Hubbard at winchesterchess@gmail.com. 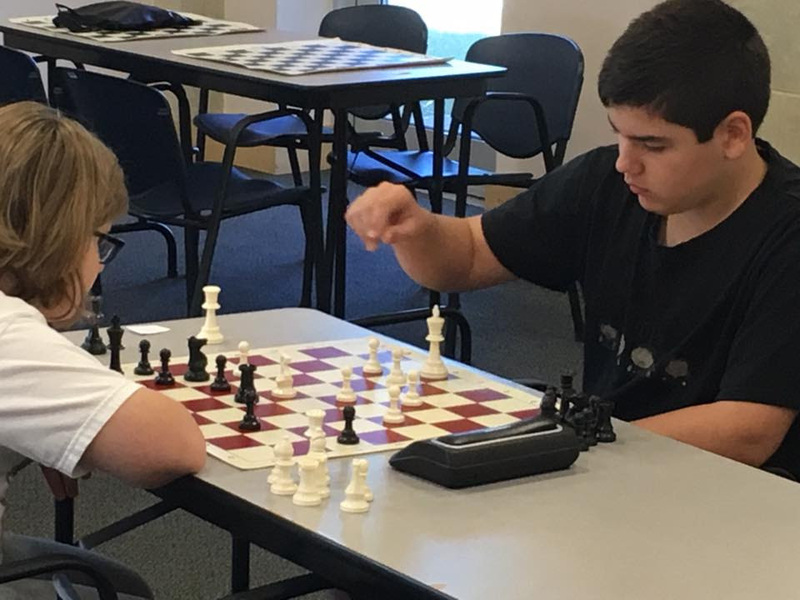 The National Chess Day Tournament at Lord Fairfax Community College - Middletown Campus is coming Saturday, October 13. Look for Shenandoah Valley tournament announcements in U.S. Chess Tournament Listings and upcoming Chess Life magazines! We are working on the online registration link and will announce as soon as it is ready to go! This USCF rated tournament will have multiple sections to accommodate a wide range of players and skill levels (scholastic and adults). We would like to thank Lord Fairfax Community College for the opportunity to collaborate on what promises to be a very fun event! We are 90 days away from the 2018 World Chess Championship - Magnus Carlsen (NOR) vs. Fabiano Carauna (USA) in London, UK! • Congratulations to the American Grandmaster Carauna on the historic achievement of reaching the World Chess Championship. We are very excited and send best wishes. 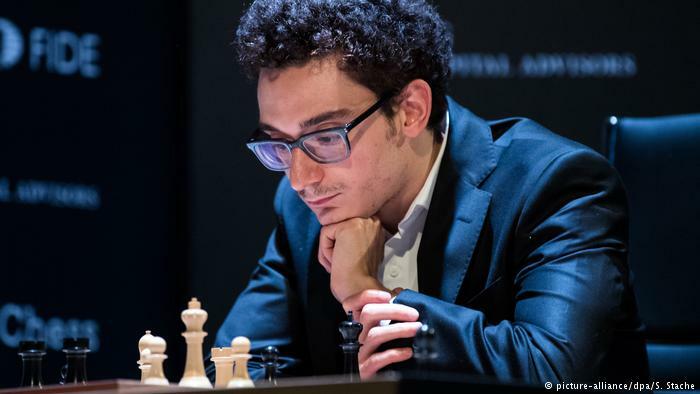 Learn more about the contestants and follow the action at https://worldchess.com. • The 10th Annual Washington Chess Congress will be held October 4-8 at Westin Tyson Corner, Falls Church, Virginia. Information on the event is available athttps://chessevents.com/washingtonchesscongress. This is a small sample of exciting activities in the chess world. Much more can be found atVirginia Chess FederationandUS Chess websites. 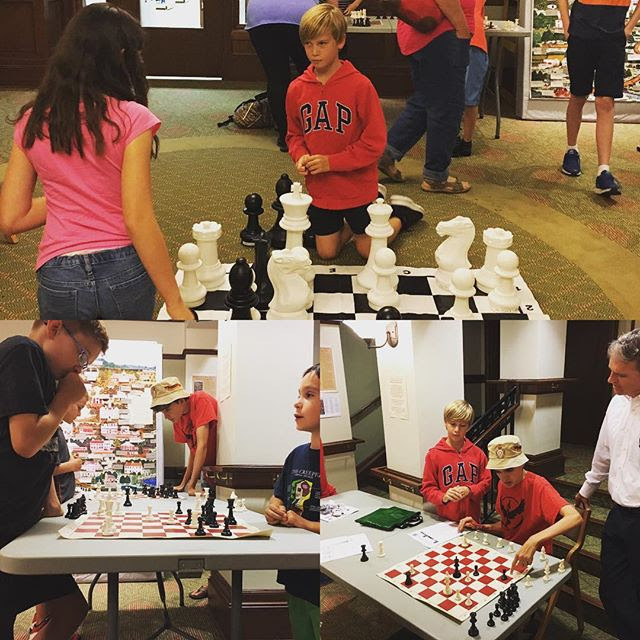 The Stephens City Chess Club meets every Saturday at Bowman Library, 10 am. ChessKid Scholastic Program and regular Wednesday meetings resume at Handley Library, August 29, 4:30 - 7:30 pm. Thank you for your continued interest and support for Chess in the Shenandoah Valley. We look forward to catching up after a busy summer. In the meantime, please be well and good luck with your games! “The game of chess is not merely an idle amusement. Several very valuable qualities of the mind, useful in the course of human life, are to be acquired or strengthened by it..."
Here is the latest Chess News in the Valley for 2018! 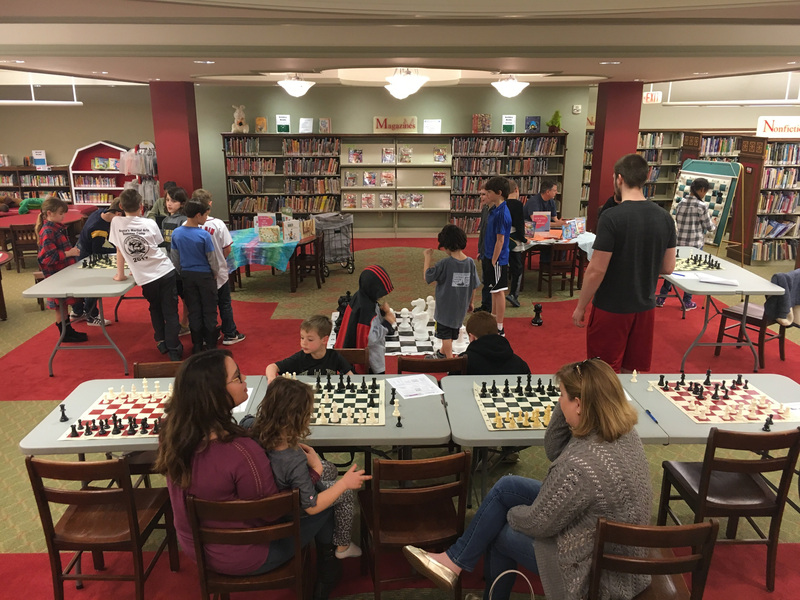 Wednesday Chess at Handley Library is on summer break until late August. Stephens City Club is still meeting every Saturday at Bowman Library - 10am. Below is a preview of Fall events. 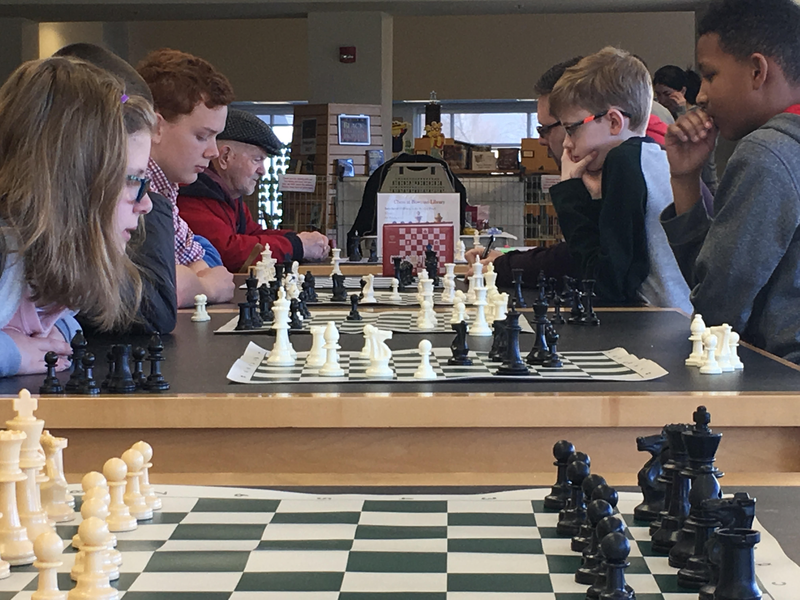 Winchester Star wrote a wonderful article about the growing excitement for Chess in the Valley and our involvement with Newtown Heritage Fest in May! We also wish to express our deep gratitude to the parents and chess players who are giving considerable time, energy, and support this year. Sections: This tournament is organized into multiple sections per grade and skill level (K-2 / 3-5 / 6-8 / 9-12 ). Medals and trophies for winners and special categories. Registration: Online Pre-registration via EventBrite begins August 18. Space limited and pre-registration is encouraged. Walk-ins are welcome. General Information: The Scholastic tournament is sponsored by Bowman Library. Chess sets, boards, and scoresheets are provided. Chess coaches will be onsite to guide first timers through tournament process and provide analysis in-between rounds. We are very happy to announce National Chess Day Tournament will be hosted in partnership with Lord Fairfax Community College - Middletown Campus! This USCF rated tournament features multiple sections to accommodate a wide range of players and skill levels. Prizes and food will be provided. Sponsorships available. Mark your calendars and standby for further details on the website. Fall 2018 is a big deal! In addition to many advances for chess in America and worldwide, the Shenandoah Valley Chess Club celebrate 5 years as a chess community! We will hold our 5-year celebration at Handley Library on Wednesday, September 5th, 4:30 to 7:30 pm. We are also happy to announce that in Year 5, we are ready to pursue 501(C)3 tax-exempt status. The organization and coordination to reach this point is a community achievement. Your advice, guidance, patience, and support - from the very start - is the bedrock of our success. 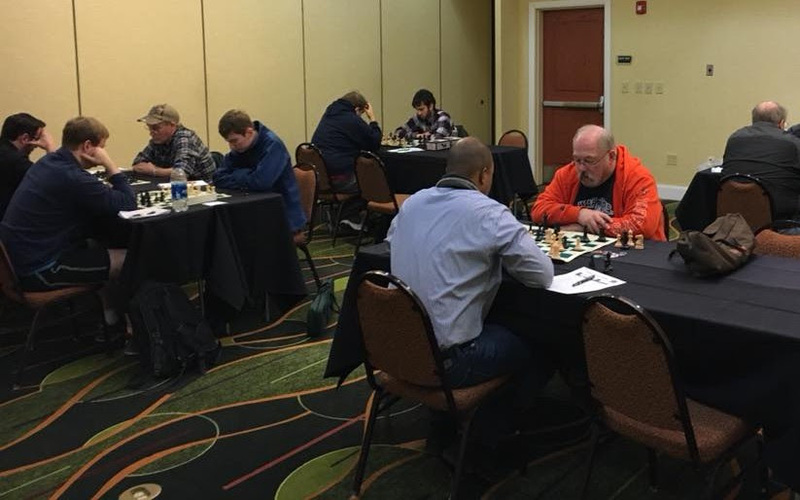 We again thank you parents and players who continually donated time, ideas, and expertise to the Shenandoah Valley Chess program! The Shenandoah Valley Chess Club returns to Handley Library with an Open House Kickoff, Wednesday, August 22 at 6:00 pm. 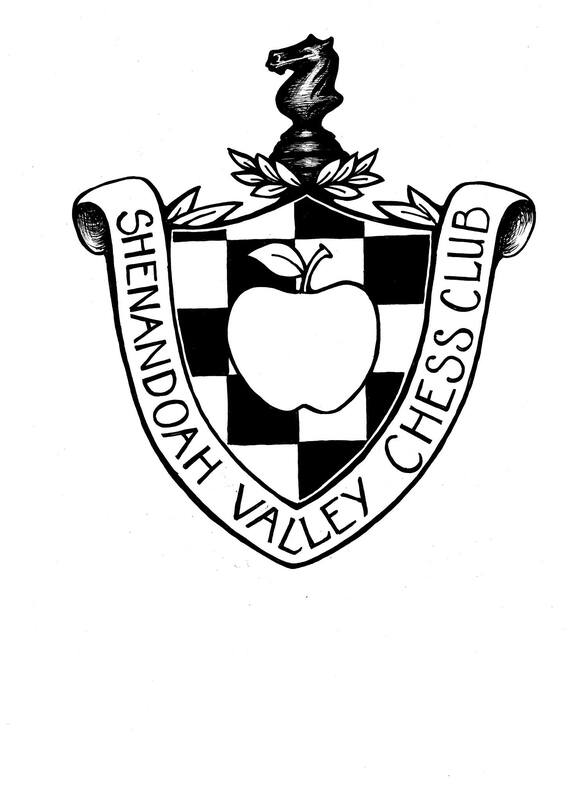 As always, we thank you for your continued support and participation with the Shenandoah Valley Chess Club! Have a great summer and good luck with your games! "Chess is a game by its form, an art by its content and a science by the difficulty of gaining mastery in it. Chess can convey as much happiness as a good book or work of music can." Great news to report, near and far! 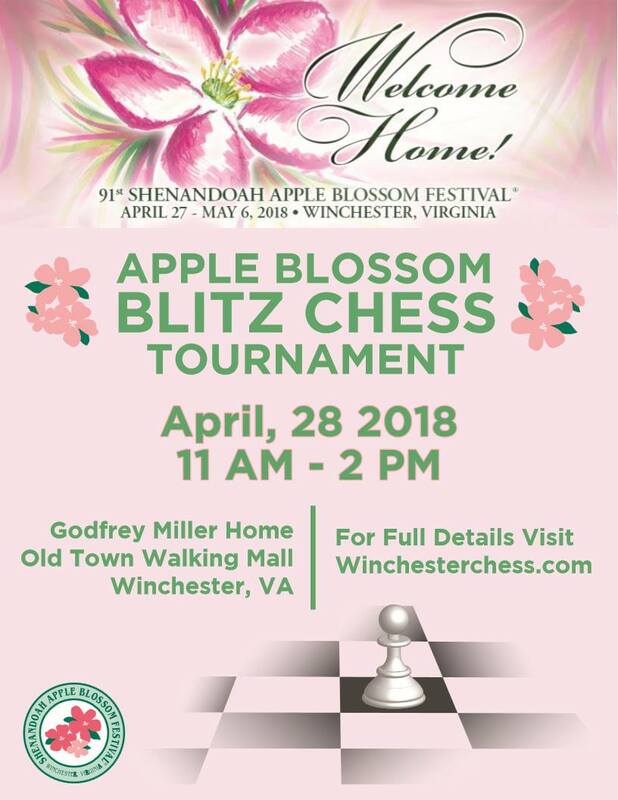 We are delighted to announce the 1st Apple Blossom Blitz Chess Tournament will be held at Godfrey Home during the 2018 Bloomin' Wine Festival in Old Town Winchester. The event is sponsored by Incredible Flying Objects and kindly supported by The Godfrey Home and Shenandoah Apple Blossom Festival. We will pair opponents according to their appropriate skill levels so everyone has fun. Win, lose, or draw - everyone plays multiple games! Spectators, beginner lessons, and casual games are FREE. Outdoor tables and giant chess set will be setup on the walking mall. 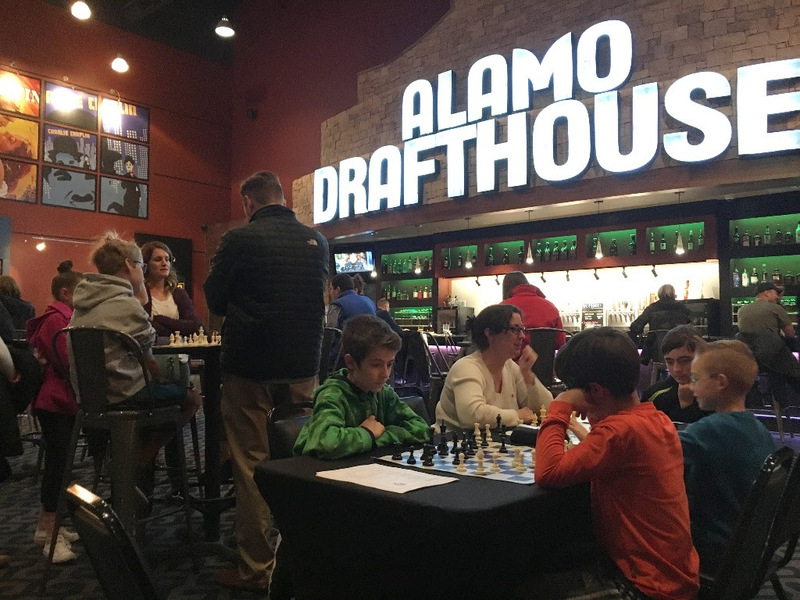 Plenty of chess fun for tournament participants, kids, and anyone who wants to play. The Bloomin' Wine Festival draws a few thousand people with live music, food, vendors, and fun for all ages. 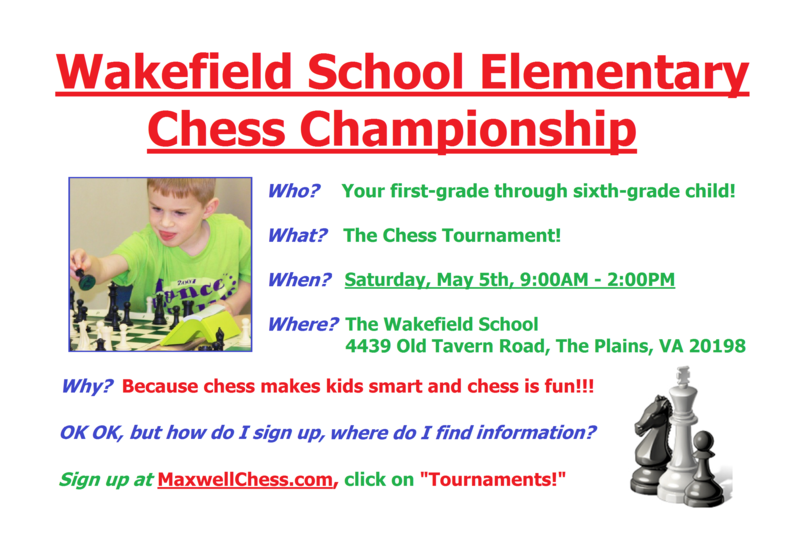 2018 WAKEFIELD ELEMENTARY CHESS CHAMPIONSHIP! 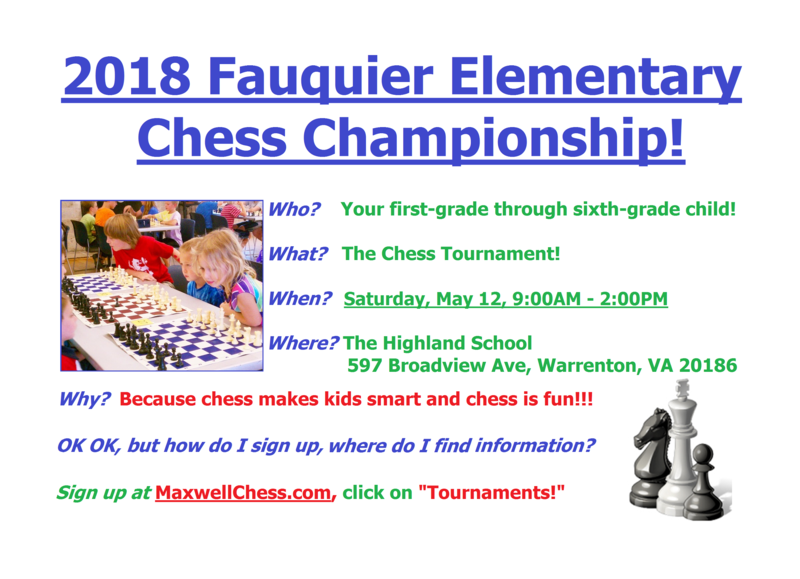 2018 FAUQUIER ELEMENTARY CHESS CHAMPIONSHIP! Why? Because chess makes kids smart, and chess is fun, and ALL PLAYERS WILL RECEIVE MEDALS OR TROPHIES!!! OK OK, but how do I sign up, where do I find information? SIGN UP at MaxwellChess.com , click on "Tournaments!" 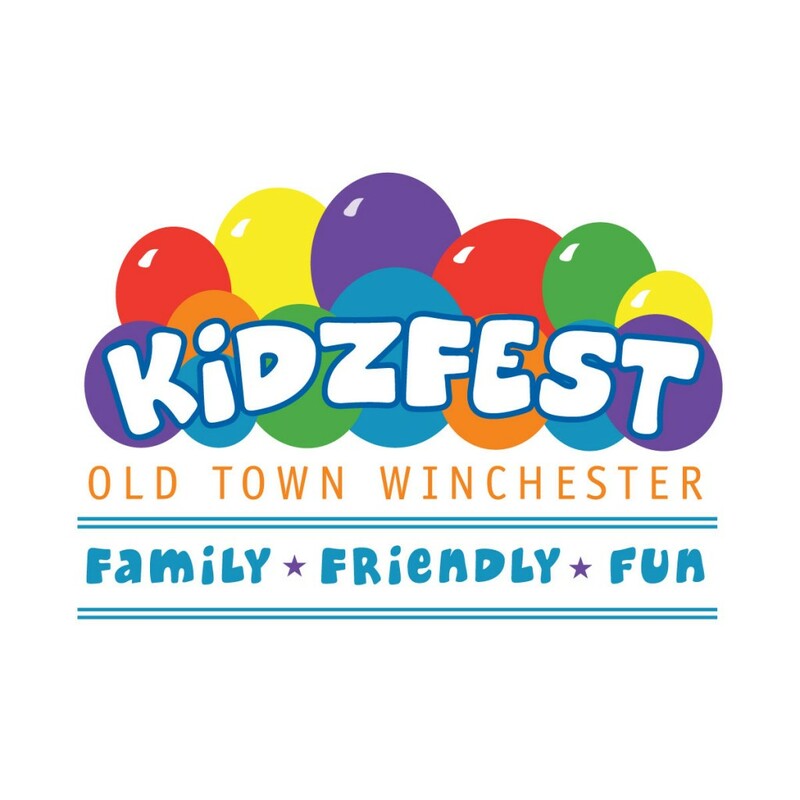 KidzFest! is a full day of free fun for kids with 60+ exhibits ranging from games, science, education, and more. SVCC will be present with chess games and beginner challenges. For more information, click here. 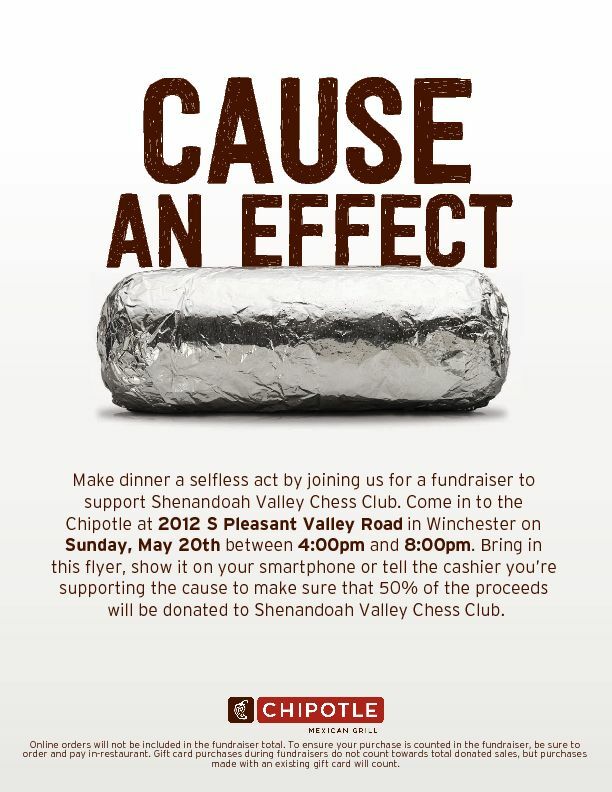 Support Chess in the Valley with a night-out at the local Chipotle Mexican Restaurant on Sunday May 20th! 50% of proceeds will benefit 2018 Shenandoah Valley Chess tournaments, youth programs, and special events. We are excited to announce that chess will be in full effect at the 2018 Newtown Heritage Festival in Stephens City, Saturday May 26. 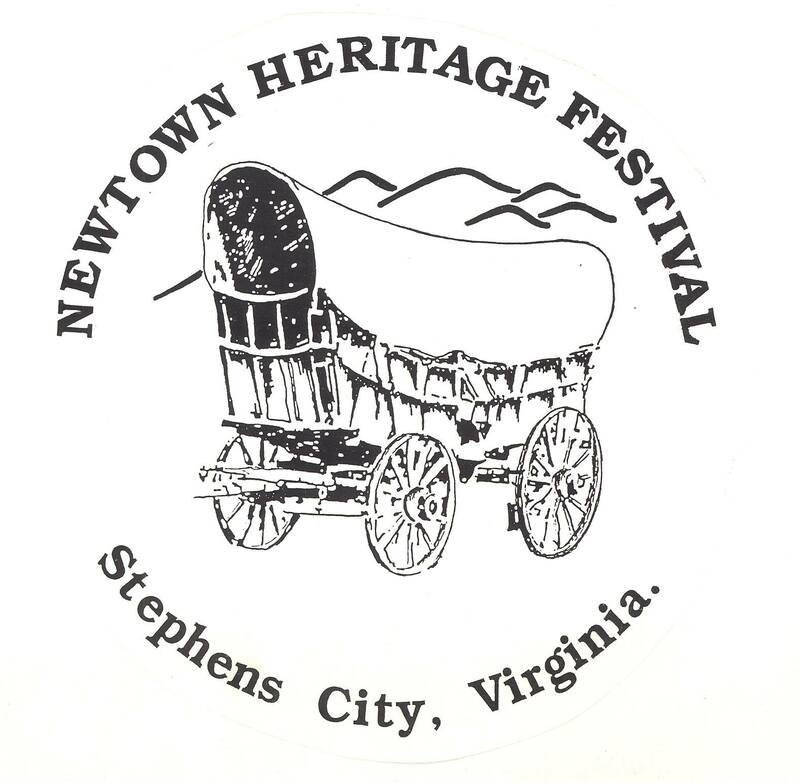 We are planning a chess competition, outdoor games, and special prizes sponsored by the Newtown Heritage Festival team and Shenandoah Valley Chess Club! Site and tournament details will be announced in early May. This will be an awesome day of family fun, celebrating the unique history of Stephens City and the Royal Game! A Great Year for American Chess! Celebrations abound for chess fans worldwide, especially in the U.S.A.! American Grandmaster Fabiano Carauna will challenge Magnus Carlsen for World Champion this November! Also, we are one week away from the 2018 U.S. Chess Championship, April 17 - 30 in Saint Louis, Missouri. The U.S. 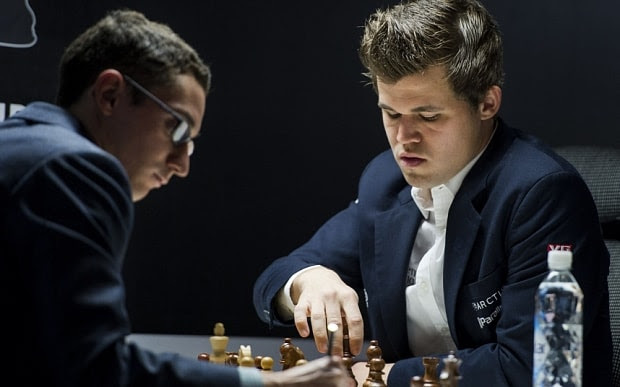 Chess Championship is one of the best online chess broadcasts of every year. This competition follows America's elite women and men chess players, move-by-move, with great commentary and excellent social media interaction. 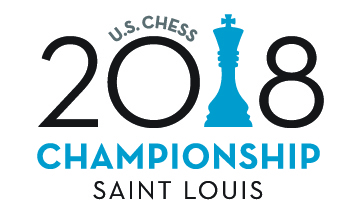 You can follow the action at https://www.uschesschamps.com. The Stephens City and Shenandoah Valley Chess Club thanks everyone for their participation and support. If you are able to volunteer with an upcoming event, please let us know. We would be very happy to have your help. As always, we look forward to meeting and playing again soon.